Television in the 1950s meant I Love Lucy, Dragnet or The Ed Sullivan Show—if you lived near Memphis, Jackson, or Monroe. Television in the Delta consisted of endless hours of test patterns and “snow”—plus the occasional program. “We were thrilled when this new-fangled thing called television debuted in the Delta around 1950,” recalls Jo G. Prichard of Jackson. “The only signal we could get in Sunflower County was WMCT, Channel 4 from Memphis, and that was only when weather conditions were perfect. “I can still remember sitting there with my buddy Walter Jones, staring in awe at the Channel 4 test pattern. A black and white picture was coming through the air all the way from Memphis to Inverness, Mississippi,” says Prichard. “We thought, ‘what is the world coming to?’ ” Prichard laughs. “During the World Series in the late 1950s, Coach Dave Dunaway at Greenville’s Bass Junior High had a TV on loan from a local store so we could watch the games in the gym,” recalls Clinton Bagley of Jackson. “This was despite the bad reception…especially if the C&G train came by. At the end of the broadcasting day, they signed off with the national anthem, then “Dixie,” and sometimes an operatic rendition of the Lord’s Prayer,” Bagley recalled. 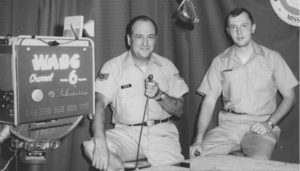 All that changed in 1959 when Cy Bahakel, owner of radio stations in Greenwood and Kosciusko, created WABG-TV Channel 6 in Greenwood with Don Neil as its first general manager. Its original tower was located beside the studios on Highway 82 near Itta Bena. The station’s original eight hour broadcast day included Amos and Andy, Gene Autry, Annie Oakley and The Honeymooners, plus local news. Originally a CBS affiliate, WABG-TV soon switched to ABC. WJTV in Jackson had complained the new station was pirating its CBS viewers since WABG-TV’s signal reached the edge of their Jackson-based market. “Channel 6 was the only station in town,” remembers veteran Delta television personality Anne Martin. “How simple it was, compared to what we have now. Johnny Casio did sports. Harold Dale did news at one point, and then later came over to WXVT. Kim Govero did weather,” she says. WABG-TV was heavily involved in community projects in Greenwood and Greenville. Pat Buttram from the popular CBS show Green Acres appeared with Lane Tucker, the station’s general manager, for a “live” March of Dimes telethon in Greenwood and $27,000 dollars was raised that year during a “live” telethon in Greenville for Mental Health. Greenville auto dealer Frank Terracina sponsored the late movie with his seemingly endless ten-minute commercials. Channel 6 was one of the first stations to stage a telethon for St. Jude’s Children’s Hospital in Memphis. Tucker was WABG-TV’s second general manager from 1965 to 1974 and Henry Hughes followed. Jim Chick became WABG-TV general manager in 1991, but he got his start working as a weekend camera man in 1968 for the Saturday morning kiddies’ show from its Greenville studio. “As a fifteen-year-old it was a really cool job,” Chick remembers. Chick worked for Bahakel for eleven years as Greenville general manager, Greenwood station manager and local account executive, respectively. The managers after Chick were John Rogers, Mike Elrod, and Sherry Nelson. And nothing pleased Delta viewers more than when Hoda Kotb became co-anchor of the Today Show this winter. 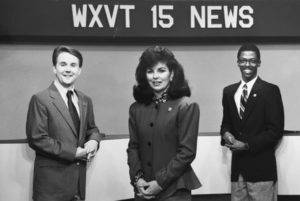 The late Stan Sandroni, former station manager who later became the sideline announcer for the Ole Miss rebel football team, gave the NBC star her first job, reporting Delta news on WXVT in Greenville in 1987. Through the years as her career has blossomed, Kotb has often expressed her gratitude for the opportunity Sandroni gave her. In 1967, Greenwood-based WABG-TV brought live television broadcasting to Greenville with studio facilities on Washington Avenue. “Greenville was intended to be a satellite only,” according to Tucker. Joel Netherland was Greenville’s first manager. He left to operate his own radio station in Yazoo City and Dennis Hancock succeeded him. For years this building was nearly empty and housed Delta Design Group during that advertising agency’s early years. In 1983 the station built a new tower almost 2,000 feet tall at Inverness which is still in use today. Greenville accountants Ben Sayle and Joe Macione recruited several of their clients and founded Big River Broadcasting beginning the long, lonely road to creating a second television station from scratch. Veteran television executive Melvin Caldwell of Fort Smith, Arkansas, joined the investors and provided much needed familiarity with everything from Federal Communications Commission requirements to pilots’ concerns about whether the 880 foot tower near Cleveland posed problems for Cleveland airport users. One problem ultimately proved insurmountable. The FCC issues a station’s Construction Permit (CP) with a shelf life of eighteen months. Use it or lose it. Unfortunately for Big River, its CP was issued just as interest rates skyrocketed. Unlike today, the Federal Reserve was then waging a war with inflation. In an effort to tame double-digit inflation, the central bank drove interest rates higher, topping over eighteen percent. FCC’s granting of a CP started the clock running. The building, the tower, the equipment, everything was ordered. WXVT was a Greenville station on Channel 15, always a CBS affiliate. Anne Martin was soon joined by Norma DeLong and Dave Dunaway among the early Delta faces seen on Channel 15. “It was very exciting when this new station opened,” Anne Martin recalls. “We all grew up watching Channel 6 and now there was competition. It made the Channel 15 news department work a little harder. We wanted to do a good job and beat the competition. It was a fun station to work at,” Martin said. Although Channel 15 had success selling advertising locally, regionally and through CBS, it was unable to overcome the initial handicap created by the high cost of money borrowed to build the station. In 1984 Big River sold the station to Lamco Communications of Williamsport, Pennsylvania, for $4,800,000. Lamco then sold WXVT to a local ownership group in 1991 and Saga Communications purchased it in 1999. In 2006, WABG-TV launched Delta Fox 10. Delta Fox network started airing all Fox programming. In 2004, Nelson became Vice President/General Manager of WABG-TV. Three years later, Bahakel sold WABG-TV to Commonwealth Broadcasting Group. Nelson managed three major network stations (ABC, FOX, and NBC) for Commonwealth from the primary broadcasting facility in Greenville. In addition, she was also responsible for overseeing services shared by Commonwealth and H3 Communications for WXVT until mid 2016, when the cluster of stations sold to Cala Broadcasting. After Cala purchased WABG-TV and WXVT, the new owners decided to put it all under the same roof. That meant one newscast across four networks. Several years ago, Channel 6 had acquired Fox and NBC signals, rebroadcasting what the network sent: some daytime talk shows and a version of the news currently broadcast by Channel 6. The new owners decided to have one news department with one newscast for the four network signals. The old WABG-TV building in downtown Greenville was remodeled to make room for everyone. WXVT’s Reed Road building was emptied. Some items and equipment made the move. Others were discarded and the building is empty and now for sale. “It’s sad,” says Martin. “Technically WXVT doesn’t even really exist anymore,” she said. Due to broadcast and transmitter issues, WXVT went off the air in late 2016 and CBS moved to NBC affiliate WNBD-LD. “It broke my heart they day they closed the WXVT building,” said Martin.